Pigments for sale at a market in Goa, India. Cotton being dyed manually in contemporary India. The primary source of dye, historically, has been nature, with the dyes being extracted from animals or plants. Since the mid-19th century, however, humans have produced artificial dyes to achieve a broader range of colors and to render the dyes more stable to washing and general use. Different classes of dyes are used for different types of fiber and at different stages of the textile production process, from loose fibers through yarn and cloth to complete garments. Acrylic fibers are dyed with basic dyes, while nylon and protein fibers such as wool and silk are dyed with acid dyes, and polyester yarn is dyed with disperse dyes. Cotton is dyed with a range of dye types, including vat dyes, and modern synthetic reactive and direct dyes. The word dye is from Middle English deie and from Old English dag and dah. The first known use of the word dye was before the 12th century. The earliest dyed flax fibers have been found in a prehistoric cave in the Republic of Georgia and date back to 34,000 BC. More evidence of textile dyeing dates back to the Neolithic period at the large Neolithic settlement at Çatalhöyük in southern Anatolia, where traces of red dyes, possibly from ocher, an iron oxide pigment derived from clay, were found. In China, dyeing with plants, barks, and insects has been traced back more than 5,000 years. :11 Early evidence of dyeing comes from Sindh province in Pakistan, where a piece of cotton dyed with a vegetable dye was recovered from the archaeological site at Mohenjo-daro (3rd millennium BCE). The dye used in this case was madder, which, along with other dyes such as indigo, was introduced to other regions through trade. 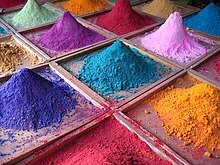 Natural insect dyes such as Cochineal and kermes and plant-based dyes such as woad, indigo and madder were important elements of the economies of Asia and Europe until the discovery of man-made synthetic dyes in the mid-19th century. The first synthetic dye was William Perkin's mauveine in 1856, derived from coal tar. Alizarin, the red dye present in madder, was the first natural pigment to be duplicated synthetically in 1869, a development which led to the collapse of the market for naturally grown madder. :65 The development of new, strongly colored synthetic dyes followed quickly, and by the 1870s commercial dyeing with natural dyestuffs was disappearing. Dyes are applied to textile goods by dyeing from dye solutions and by printing from dye pastes. Methods include direct application and yarn dyeing. Selection of the appropriate dye is important because any given dye is not applicable on every type of fiber. Furthermore, resistance to washing, rubbing and light differ among dyes. The choice of dye depends on the objective in dyeing and which material is to be dyed. For example, indigo dyes have poor wash and rubbing fastness on denim (cotton), so they are used to produce washed-down effects on that fabric. In contrast, vat or reactive dyes are applied on cottons to achieve excellent washing fastness. The term "direct dye application" stems from some dyestuff having to be either fermented as in the case of some natural dye or chemically reduced as in the case of synthetic vat and sulfur dyes before being applied. This renders the dye soluble so that it can be absorbed by the fiber since the insoluble dye has very little substantivity to the fiber. Direct dyes, a class of dyes largely for dyeing cotton, are water-soluble and can be applied directly to the fiber from an aqueous solution. Most other classes of synthetic dye, other than vat and surface dyes, are also applied in this way. The term may also be applied to dyeing without the use of mordants to fix the dye once it is applied. Mordants were often required to alter the hue and intensity of natural dyes and improve color fastness. Chromium salts were until recently extensively used in dyeing wool with synthetic mordant dyes. These were used for economical high color fastness dark shades such as black and navy. Environmental concerns have now restricted their use, and they have been replaced with reactive and metal complex dyes that do not require mordant. There are many forms of yarn dyeing. Common forms are the package form and the hanks form. Cotton yarns are mostly dyed at package form, and acrylic or wool yarn are dyed at hank form. In the continuous filament industry, polyester or polyamide yarns are always dyed at package form, while viscose rayon yarns are partly dyed at hank form because of technology. The raw yarn is wound on a spring tube to achieve a package suitable for dye penetration. These softened packages are loaded on a dyeing carrier's spindle one on another. The packages are pressed up to a desired height to achieve suitable density of packing. The carrier is loaded on the dyeing machine and the yarn is dyed. After dyeing, the packages are unloaded from the carrier into a trolley. Now the trolley is taken to hydro extractor where water is removed. The packages are hydro extracted to remove the maximum amount of water leaving the desired color into raw yarn. The packages are then dried to achieve the final dyed package. After this process, the dyed yarn packages are packed and delivered. Garment dyeing is the process of dyeing fully fashioned garments subsequent to manufacturing, as opposed to the conventional method of manufacturing garments from pre-dyed fabrics. Up until the mid-1970s the method was rarely used for commercial clothing production. It was used domestically, to overdye old, worn and faded clothes, and also by resellers of used or surplus military clothing. The first notable industrial use of the technique was made by Benetton, which garment dyed its Shetland wool knitwear. In the mid-1970s the Bologna clothing designer Massimo Osti began experimenting with the garment dyeing technique. His experimentation over the next decade, led to the pioneering of not just the industrial use of traditional garment dyeing (dyeing simple cotton or wool garments) but, more importantly, the technique of “complex garment dyeing” which involved dyeing fully fashioned garments which had been constructed from multiple fabric or fiber types (e.g. a jacket made from both nylon and cotton, or linen, nylon and polyurethane coated cotton) in the same bath. Up until its development by Massimo Osti (for his clothing brand C.P. Company), this technique had never been successfully industrially applied in any context. The complexity lay in developing both a practical and chemical understanding of how each fabric responded differently to the dye, how much it would shrink, how much color it would absorb, developing entirely new forms of quality control to verify possible defects in fabric before dyeing etc. the fact that each fabric and fiber type responds differently to the dye also produces a “deconstructed” effect, whereby the consumer's attention is drawn to the construction techniques of the jacket. For example: a more densely woven fabric absorbs the color less intensely than a more open weave, the polyester stitching used for a cotton garment does not absorb any dye color, producing a contrast color stitch etc. Today, whilst garment dyeing is a diffusely employed as an industrial technique around the globe, predominantly in the production of vintage style cotton garments and by fast fashion suppliers, complex garment dyeing is still practiced almost exclusively in Italy, by a handful of premium brands and suppliers who remain committed to the art. The dyer of the fountain "Weberbrunnen" in Monschau (Germany). If things go wrong in the dyeing process, the dyer may be forced to remove the dye already applied by a process called "stripping" or discharging. This normally means destroying the dye with powerful reducing agents such as sodium hydrosulfite or oxidizing agents such as hydrogen peroxide or sodium hypochlorite. The process often risks damaging the substrate (fiber). Where possible, it is often less risky to dye the material a darker shade, with black often being the easiest or last option. ^ a b "Dyeing". The Free Dictionary By Farlex. Retrieved 2012-05-25. ^ "Dye". Merriam-Webster. Retrieved 2012-05-25. ^ a b Goodwin, Jill (1982). A Dyer's Manual. Pelham. ISBN 978-0-7207-1327-5. ^ a b Bhardwaj, H.C. & Jain, K.K., "Indian Dyes and Industry During 18th-19th Century", Indian Journal of History of Science 17 (11): 70-81, New Delhi: Indian National Science Academy. ^ Hans-Samuel Bien, Josef Stawitz, Klaus Wunderlich "Anthraquinone Dyes and Intermediates" in Ullmann’s Encyclopedia of Industrial Chemistry, 2005, Weinheim: 2005. doi:10.1002/14356007.a02 355. Look up dyeing in Wiktionary, the free dictionary. Wikimedia Commons has media related to Dyeing.